Shell Shock SLOW - 8 minute working time - full cure 5 hours at 3/8" thickness. In response to customer requests for a "non-fiber filled" thixotropic plastic that will hold a vertical surface, Smooth-On has developed a product we are calling "Shell Shock". "Shell" because because the plastic can be used to form a shell and "shock" in reference to this product's good impact resistance vs. other products on the market. 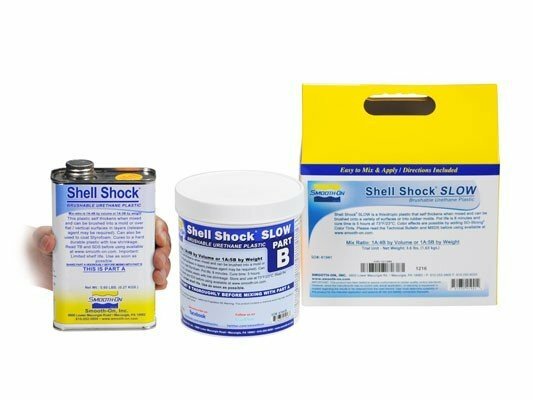 Applications - Shell Shockï¿½is ideal for making fast, lightweight rigid molds and for creating silicone appliances and effects (use as a replacement for stone molds). 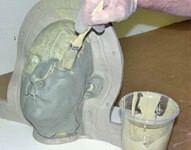 You can also brush a "gel coat" into a rubber mold and back it up with rigid foam, creating a highly detailed lightweight casting. This product can be brushed onto styrofoam (polystyrol) as an impact resistant coating that can be sanded, primed and painted (minimum 3 coats recommended). Shell Shockï¿½ can also be used to make thin, lightweight rigid support shells (mother molds) to support brush-on rubber molds. It is mixed 1A:4B by volume and steadily develops thixotropy (becomes thick). Applied in thin sections, the mixture will hold a vertical surface. Like any brush-on material, if you apply too thick it will sag. Pot life is on the fast side at about 3 minutes which helps with thixotropy, but you have to be aware of your working time. The material will stick to itself, so you can quickly build 3 to 4 layers to a minimum recommended thickness of 3/8" (1 cm) which is recommended for impact resistance. Time between coats is about 15 minutes depending on mass. Do not disturb the previous layer. Material cures in about 1 hour at room temperature (depending on mass). Gel time and cure time can be reduced with mild heat. How Is Shell Shock Different From Plasti-Paste. Plasti-Paste is heavily filled with fibers which provide strength and make Plasti-Paste a good "mother mold / support shell" material. The fibers make Plasti-Paste thick to the point where you can trowel the material onto surfaces without thickness limitation. 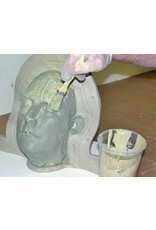 Cured Plasti-Paste exudes an oil that makes it difficult to paint. Shell Shockï¿½ is a different product that chemically thickens and is best applied in thin layers. Applied more like a brush-on rubber (such as Rebound 25) Shell Shock wets out nicely on a variety of surfaces. 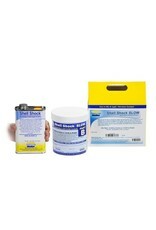 When cured, it is harder and more rigid at Shore 85D (vs. 70D for Plasti-Paste). Shrinkage on Shell Shock is very low at .0006 in/in. (cm/cm). You can also sand and paint Shell Shock.